Home / Business Travel Blog / As inflight wifi becomes more common, do customers actually want to be connected all the time? 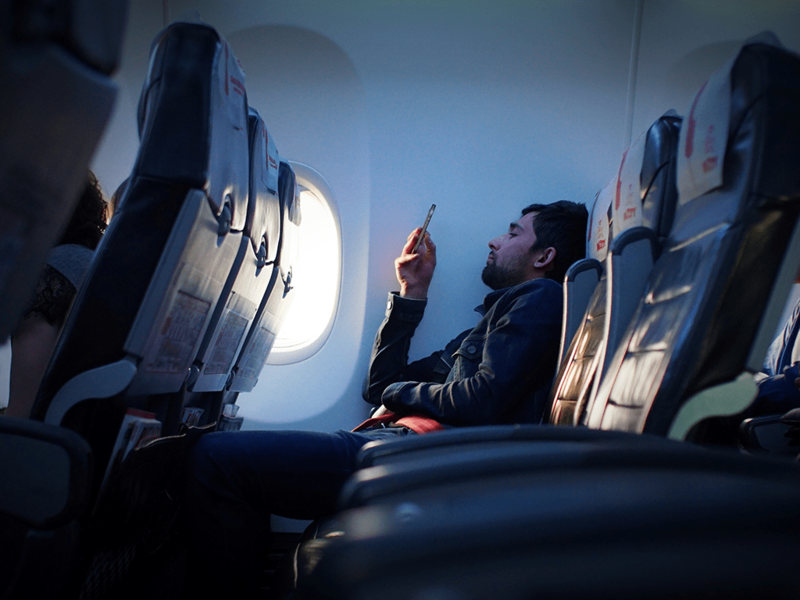 In a world where we are always contactable, being on a long flight with the only taxing decision being which film to watch is a welcome rest bite for a lot of us. However, with the increasing reliance on technology in our day-to-day lives, the demand for Wi-Fi onboard has grown and airlines are responding. Whilst Wi-Fi has become commonplace on internal flights in the US, achieving cost-effective, consistent Wi-Fi for 350+ customers whilst travelling across the Atlantic has been elusive for most European carriers. However, with Virgin recently announcing that their entire fleet is Wi-Fi enabled and other European carriers promising it is coming soon, the focus is moving from accessibility towards cost, speed and impact on the customer experience – both positive and negative. In-flight Wi-Fi is a service that most customers say they don’t mind paying a little extra for and for airlines the additional cost of the Wi-Fi, both the initial outlay and the ongoing fuel burn cost, is something they’ll need to offset, so it sounds like a win-win. However, it remains to be seen how the pricing model will evolve with carriers like JetBlue and Delta already offering elements of connectivity for free. For example, Delta customers can use WhatsApp, imessage and Facebook messenger for free when travelling on a Wi-Fi enabled flight (customers must have already downloaded the apps and can only send text and emojis, not images), however Virgin are currently charging £2.99 for the same messaging capability on their flights. Netflix are hoping to offer a solution by extending bandwidth-efficient technology built for mobiles to airlines, claiming it will save up to 75 percent in bandwidth costs. They currently have partnerships with the Alaska Air Group, Aeromexico, Qantas and Virgin Australia with passengers able to access Netflix from their personal devices and watch the streaming service at no extra charge (non-members can sign up onboard for a 30-day free trial). This development is an interesting collaboration with airlines benefiting from a more sustainable cost model and positive brand association, whilst Netflix continue their mission to make their content available to as many customers on as many devices as possible. In March British Airways parent company IAG, which also owns Aer Lingus and Iberia, announced they are set to introduce new high speed wifi on board selected aircraft this June before rolling it out across 90 per cent of its short haul fleet by 2019. As airlines look to exploit the new Wi-Fi capability, American Airlines is one of the latest carriers to order new aircraft without the in-flight back-seat video screens. Instead, the airline is looking to directly stream content to passengers’ personal electronic devices. As a potential revenue stream, they, understandably, claim that this offers the customer significantly more variety and control over what they watch. Do customers really want to have to hold their phone while they watch a film (and try and eat at the same time!)? What happens when their battery runs low, will there be wireless charging, or will customers have to plug in to enable them to continue watching? And what about the premium experience? Will airlines provide business and first-class customers with devices to use? Will seats be adapted to hold devices and wirelessly charge them? However, what impact does this have on customer experience? Even putting aside the logistical issues with customers using their own devices, is it desirable for customers to potentially sit next to someone who uses skype to dial in to a conference call (not currently possible but surely this is an inevitability)? Or who’s phone is constantly beeping with messages/emails coming through? To protect customers who want a peaceful, internet free zone, will we need quiet zones like the ones introduced on trains? I would argue that as technology develops, the customer experience and associated impact needs to be considered in as much detail as the pricing policy. These arguments are the ones Ryanair and easyJet say they are listening to and neither have any plans to introduce Wi-Fi. It’s clear this is an area that is going to evolve and change over the next few years, as customers get used to being connected in the air and wider technology and innovation continue to develop. Air France is an airline who has taken the improvements to onboard entertainment to the next level by trialling an ‘immersive entertainment system with virtual reality headsets that allow passengers to enjoy 3D and 2D programmes during flights.’ Customers travelling in Business class between Paris and St Martin can trial one of four headsets compatible with 40 films and series. It remains to be seen if this is popular enough with customers for them to want to pay for it or whether it will be a differentiator for business class customers. Wherever technology leads us, it is clear that the days of being uncontactable in the air are coming to an end but how this will impact the customer experience remains to be seen.